A rehearsal update with some blocking challenges and triumphs as well as a mask announcement. Rehearsal Blog 10/3/18: Composition Week! Our cast hard at work brainstorming their Macbeth composition assignments. Another rehearsal update! In this installment: a look at one of our creative ensemble processes, creating compositions based on thematic aspects of the show, as well as an interview with our director, Nick Tash and his rationale behind composition week. Rehearsal Blog 9/13/18: Mask Work with Todd! Some of Todd Espeland’s absolutely fabulous masks that we got to work with this week. The time: just before 7 p.m. The place: Purdue University Fort Wayne Studio Theatre. The mood: excitement and a robust sense of positive anticipation. Why? We’ve jumped right into our rehearsals for Macbeth, with our production coming up at the end of November! This week, before we get into table work with our scripts, we’ve been focusing on physicality and an introduction to the mask work that will be so very important later in the process. Because our actors come from backgrounds of varying familiarity with mask technique, we invited Todd Espeland, the new Executive Artistic Director of the Fort Wayne Youththeatre, to come and lead us in a series of workshops. An expert in the field, Todd has done post-graduate work in Mask, Clown, and Commedia Dell’Arte at Dell’Arte International in Blue Lake, California, among many other impressive theatrical credentials. We were incredibly grateful to have him with us for this (too short) bit of time. So this week, I sat down with three of our actors from Macbeth to get their takes on the experimentation we’ve been doing in and around masks, under Todd’s direction and expertise, as well as hear why they decided to join our merry band of players in the first place. We are ecstatic to welcome back Chance Parker, who is playing our Macbeth after playing our Dukes in 2017’s As You Like It. He decided to audition because he believes in what we do (thanks, Chance!) and notes that he’s excited about this show in particular. 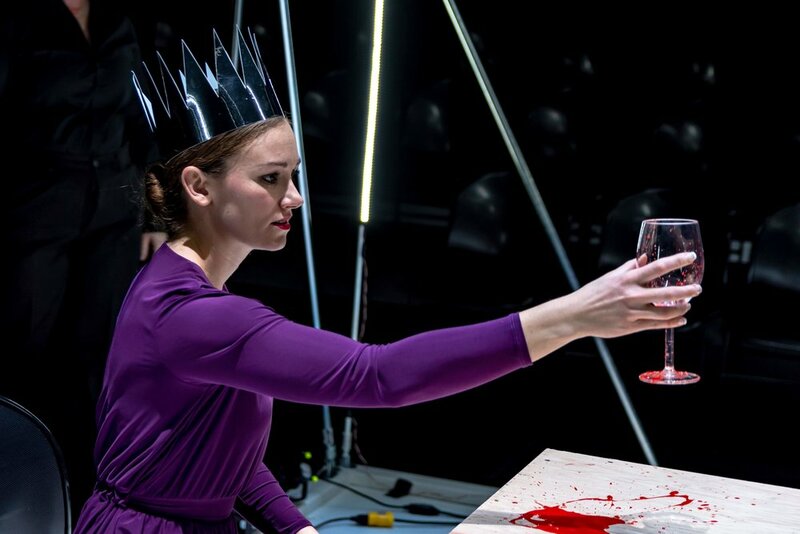 “Macbeth itself is a really fun play. It’s well known, but it’s a great one. Not only the political intrigue, which I’m really into, but you’ve also got all these supernatural elements that really add to the mood,” said Chance. Shelby Lewis (left) and Izzy Chilian (right) working on mask and countermask. Izzy Chilian is joining us in hopes of “a learning experience.” Despite not having done any shows with Shakespearemachine before, she’s no stranger to either Shakespearean texts or the Fort Wayne stage. As our First Witch (among other roles), Izzy said, “I’m really looking forward to being a little creepy. A little spooky.” It’s all about the aesthetic, am I right? And finally, I talked to Mike Adams, our understudy for Macduff, whom you might recognize from the IPFW stage along with Chance. Mike is also a first-time Shakespearemachine cast member but was intrigued by the idea of working with masks further than he has during rehearsals in the past. So what do all three of these actors think about our mask work so far? A little mask improvisation. From front to back: Chance Parker, Sloan Amburgey-Thomas, and Amber Albright. What’s really special about the mask work is that it opens doors into new ways of seeing the text and interacting with the world that’s built within it. “I think it’s kind of incredible. Like, it’s not just mask work. You can apply it to any part of theatre,” said Izzy. We thank Todd for his enthusiasm and energetic personality as he joined us this week and helped to open up those doors for us. As we move into more movement, viewpoints, and devising next week, and then table work the next, I’ll keep you updated on what’s happening in rehearsals! Keep an eye out on our Facebook page and Instagram so you don’t miss our next update - and if you’re interested in coming to see how all this mask work will come together during the performance, tickets will go on sale soon! Shakespearemachine will be performing Macbeth at the Parkview Physicians Group ArtsLab (300 E. Main St., Fort Wayne, IN), November 30 through December 16.